So let’s start off with the “must haves” of my purchase… It had to be below 1000 bucks, not too aggressive since it was going on my daily, be readily accessible, from a company with a good reputation, no pillow ball top hats, and no crazy spring rates. Now that you know the criteria of my purchase I don’t want to get comments about you should have bought this, or that, blah blah blah. Anyways my bushings had gone out and this was causing some uneven caster and camber on my passenger side. I was just going to replace with some more junkyard arms but I figured with how I drive this car I’m sure I would just end up blowing them out again. I could have also just gotten some aftermarket bushings and pressed them in to fix it, but the ball joints were not in the best of shape either. So I jumped on to JHP and started browsing. One thing lead to another and I ended up with some new Tein Flex Z coilovers. Much like a like an alcoholic or drug user I’m an addict, and modifying my car is an addiction. I’m addicted to making it better. There is always something that needs to be upgraded, something that I can justify to myself to purchase. I try really hard to not make these bad choices but like any addiction eventually you have to give in, it’s just the laws of nature. Now fortunately I don’t drink or do drugs so I have money to spend on car parts even though I know it’s not the right thing to do, I just can’t stop myself. I tried extra hard this time, it took me 3 weeks to go back and forth with myself to finally just pull the trigger and order some car parts. Take a moment and think to yourself about what addiction you have that makes you do things like this, do you have to lie to others about how you got certain things? have you had to wrestle morally with yourself about feeding your addiction?, have you had to lie to yourself and tell yourself that you can still manage to pay your other bills. I’m sure we all have even if it’s not about cars… If you say you haven’t then you are just lying to yourself. So I’m on JHP and my addiction just starts spiraling out of control. I need some of these, some of those, and if I’m going to do that then I might as well get this too (I’m sure you’ve all been there too ). For weeks I keep going back and adjusting my cart, “ehhh I don’t REALLY need this” or “hmmm this is pretty cheap I can always just buy it later” or my favorite ” it’s just a daily, I don’t need this for a daily.” One day I was feeling a little down or maybe a little too stressed and I finally decide to jump on JHP and complete my purchase. Instantly I’m happy, I realize that it is only momentary happiness, but it just feels so good to click “submit” and have the joy of new car parts coming. Once my coilovers arrive I’m so excited I text Ever and he comes over so he can take the pictures of the install process. Step 1: Break the lugs loose, then jack up the car at all four corners. (don’t worry, if you forget to break the lugs loose before jacking it up just have someone press the brake pedal while you break them loose.) Then remove all the wheels, and slide them under the car. This will not only act as a last chance emergency jack stand so you don’t get crushed if the car falls off the jack stands, but also the main reason I do it is to just not have clutter around. Step 2: Remove stock struts/old struts, you can either do one corner at a time (this will help you use the opposite side for reference for how it all goes back together.) Or if you are a bit more experienced with cars then you can just take all four off like it did. Step 2a: Removing the front: In the wheel well (your wheel should be removed) you will have to remove the lower fork that the axle goes through. This requires one 14mm bolt that is used to pinch the fork to the lower part of the shock. You must remove this bolt all the way, if not it will not allow the fork to completely come off the shock. Then a 17mm bolt that goes through the lower control arm, use a 17mm wrench on one side, and a 17mm socket on the other. 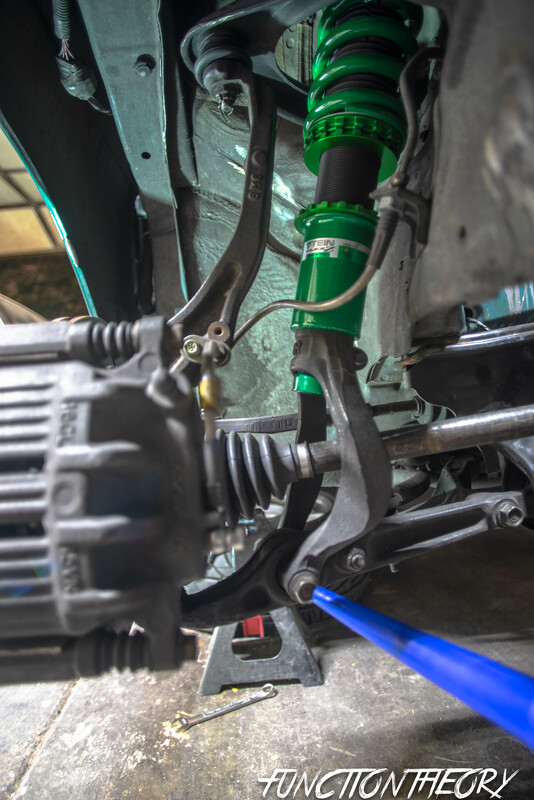 If you have stock suspension still then there will be some tension and it might be a little difficult to get off. 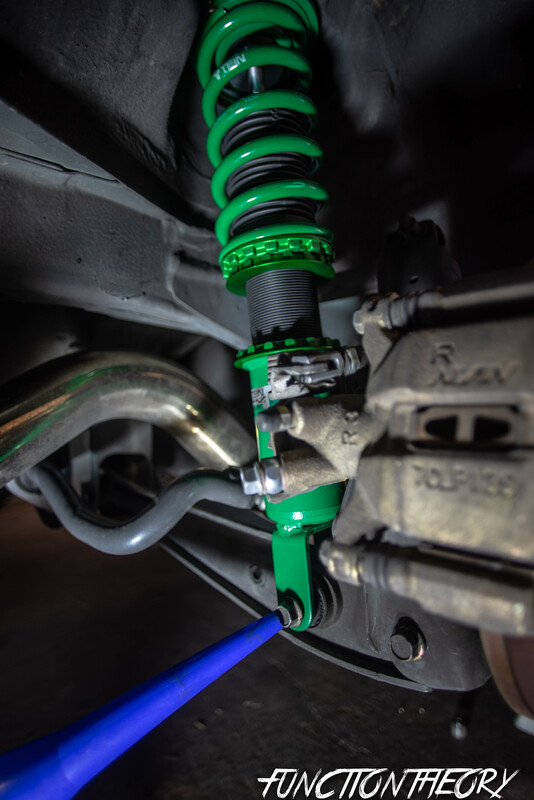 But if you have aftermarket stuff like I do ( lowering springs ) the fork should just come off with a little bit of twisting and pulling downward. Make sure both of those bolts are both completely removed. 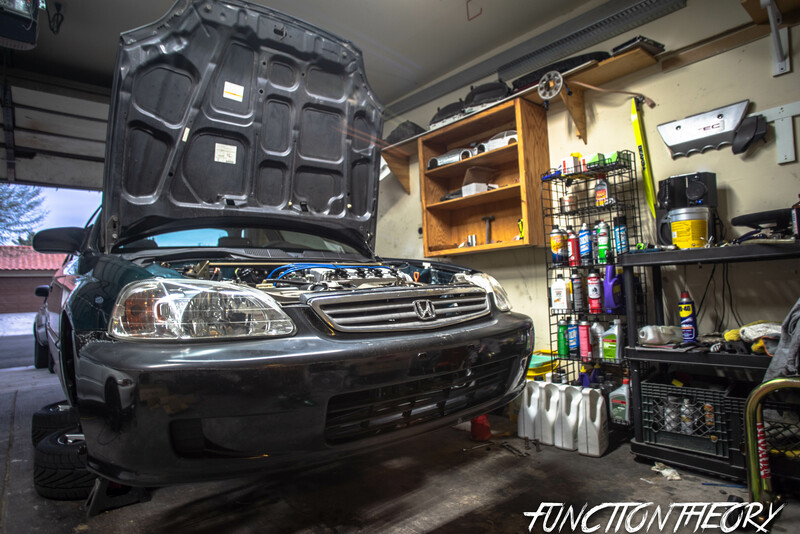 Now the only thing holding the shock on should be where it goes through the strut mounts into the engine bay. 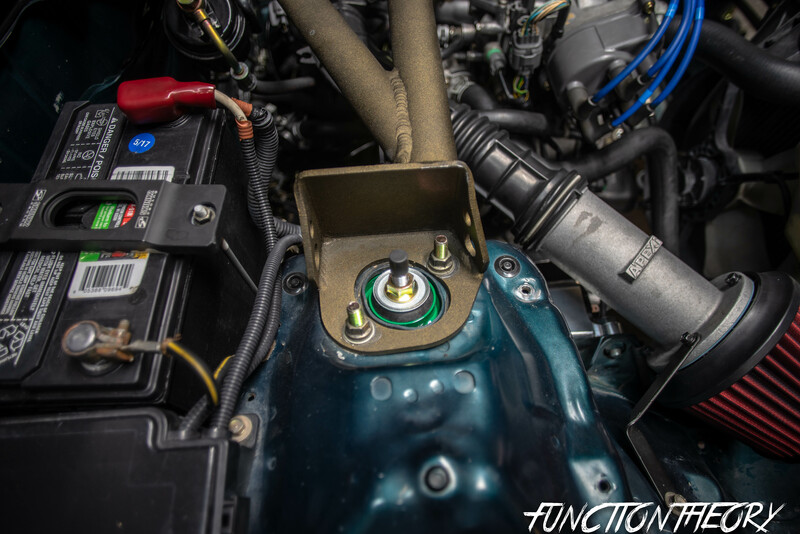 Remove two 14mm nuts on the driver and passenger side of the engine bay. ( obviously the hood will have to be popped). 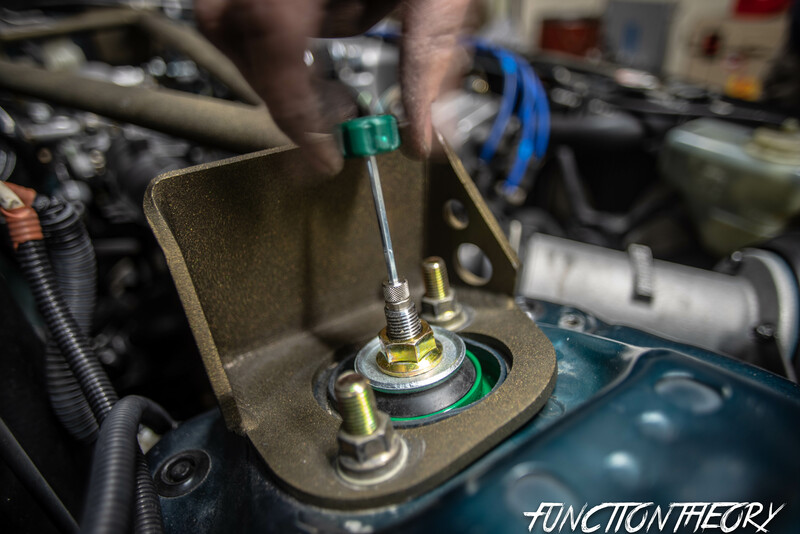 Either hold the strut as you remove the nuts, or just don’t be scared when you hear a clunk as the strut drops out the bottom. PLEASE NOTE the new coilers are already on but I’m simply showing you with the blue funnel what bolts you need to remove. Step 2b: Removing the rear: On the rear to make things easier on myself (making sure your wheel is off) I remove the 14mm bolt that is bolting the rear lower control arm to the rear spindle (bolt nearest the brakes) then I disconnect the sway bar end link from the lower control arm, this is either a 12mm, 14mm, or a 17mm depending on what sway bar you have on your car. 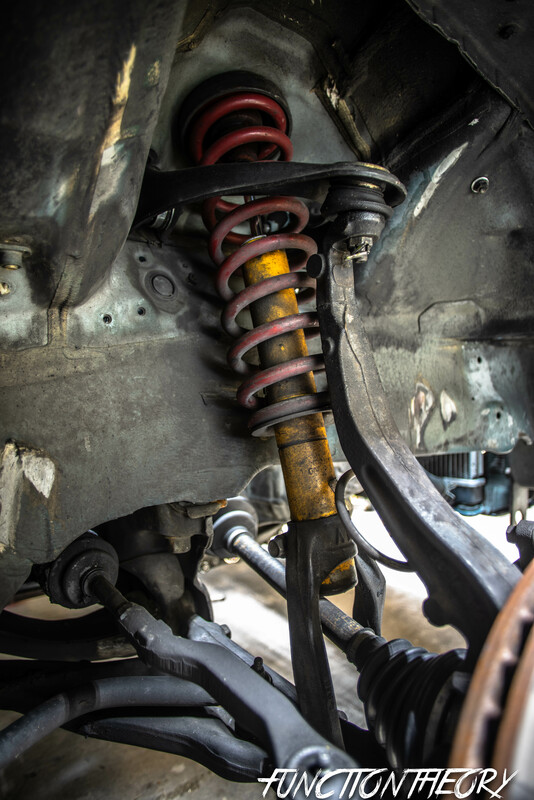 ( skip this step if you don’t have a rear sway bar). Then unbolt the 14mm bolt where the shock connects to the lower control arm. 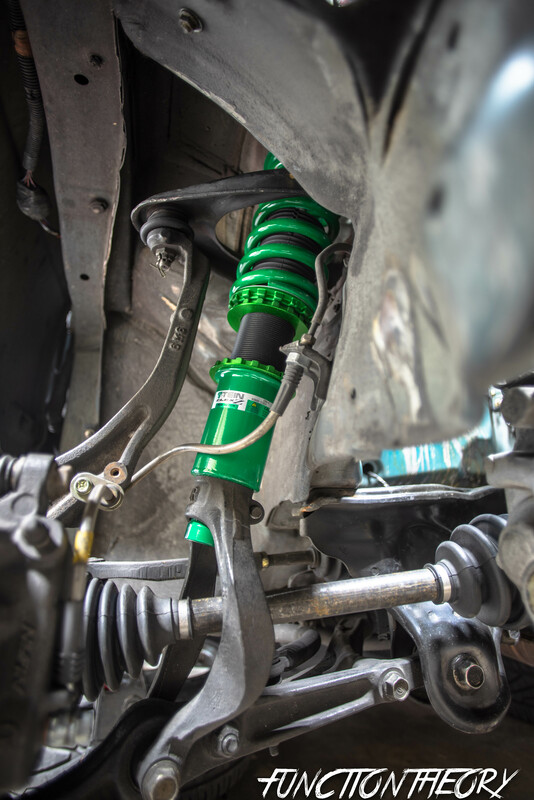 If you have stock suspension there will be some tension, but if you already have aftermarket then it will not have too much tension. 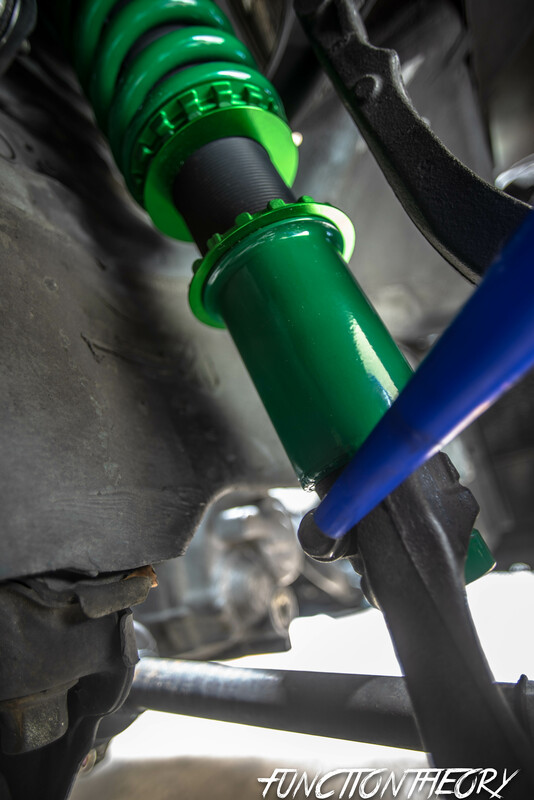 Now I firmly pull the spindle away from the car in a quick jerking motion to get it to come off the lower control arm, then push the lower control arm down toward the ground and this will give you the clearance to slide the shock out. But first you must remove the two 14mm nuts on top. If you have a coupe or sedan they are in the trunk. You have to remove the side carpet interior pieces. (mine were cut already since I have a strut bar). 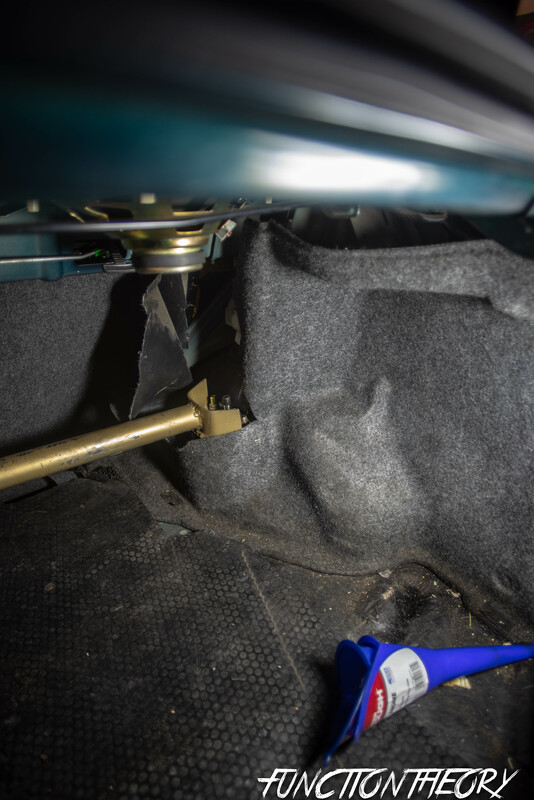 If you have a hatch back you will need to open the hatch and remove the plastic pieces that are about the size of a 3×5 card that will allow you to gain access to the upper strut 14mm nuts. Make sure you are either holding the strut as you remove the bolts, or again be ready for a clunk when it falls to the ground. for the rear you will need someone to assist you. Note the only thing not shown is which bolt to disconnect the sway bar. its easy to distinguish though. Step 4: Now it’s time to put the new coilovers in the car. Like I said earlier I took all four out at once, you can chose to the do one at a time if you’d like. 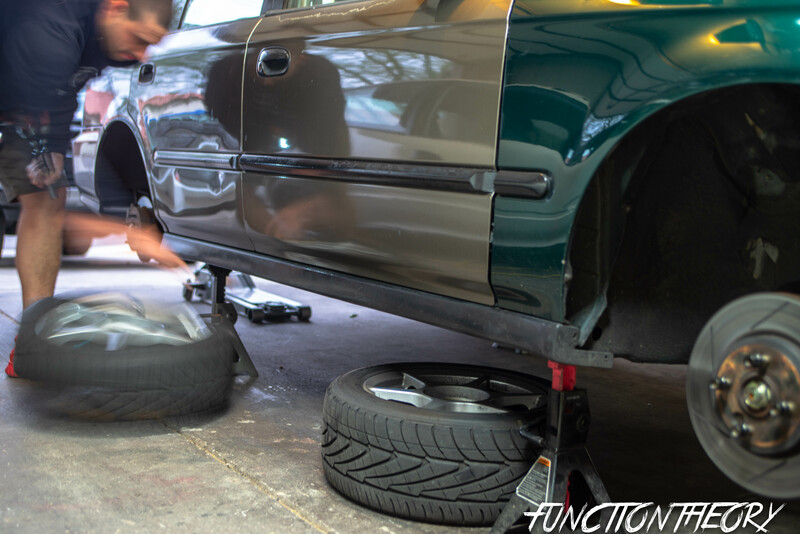 I’m not sure if there is a standard height the coil overs come, but I’m sure you will have to be re adjusting yours a few times to get you height set just right. 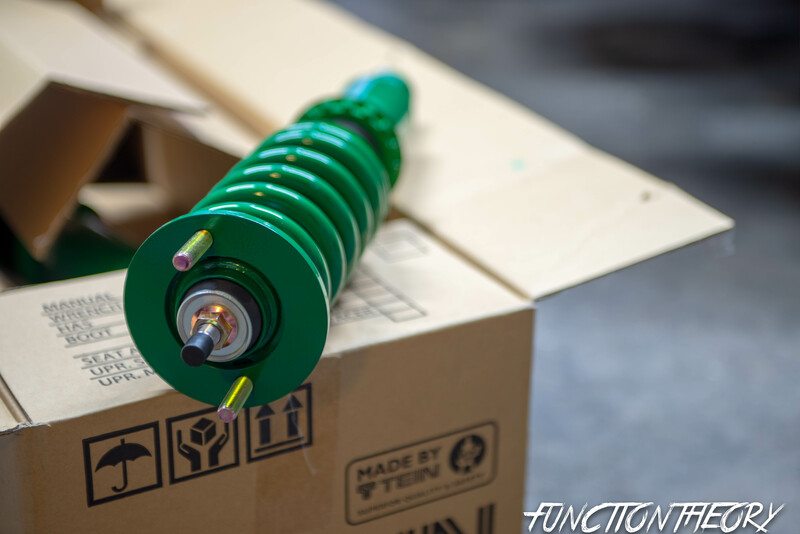 There are numerous styles of coilovers and numerous ways of adjusting the height of them. to keep things simple I’m just going to speak to the ones I have, which have a three lock rings. the upper two are used to set the spring preload, and are used to lock the spring in place. 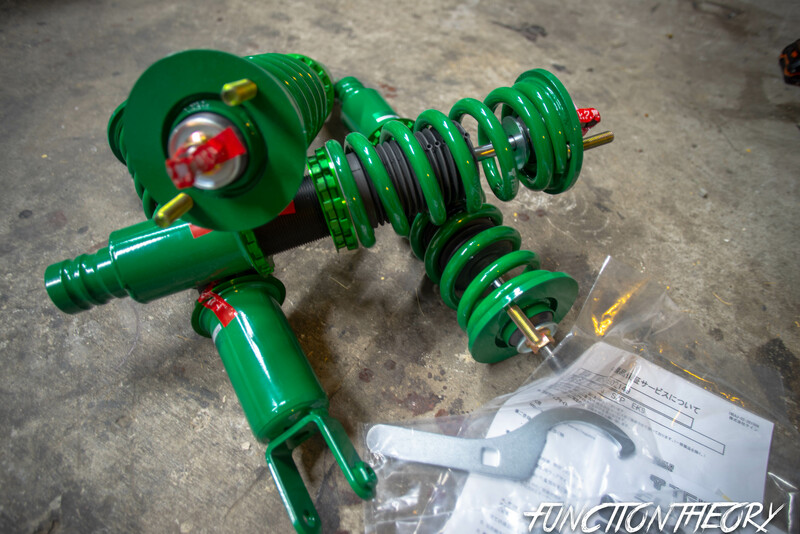 I wouldn’t mess with the preload of the springs until you have some experience with suspension tuning. Instead of rambling on and typing up all the steps about reinstalling let’s just keep it simple and say do everything you did to remove but in reverse order. 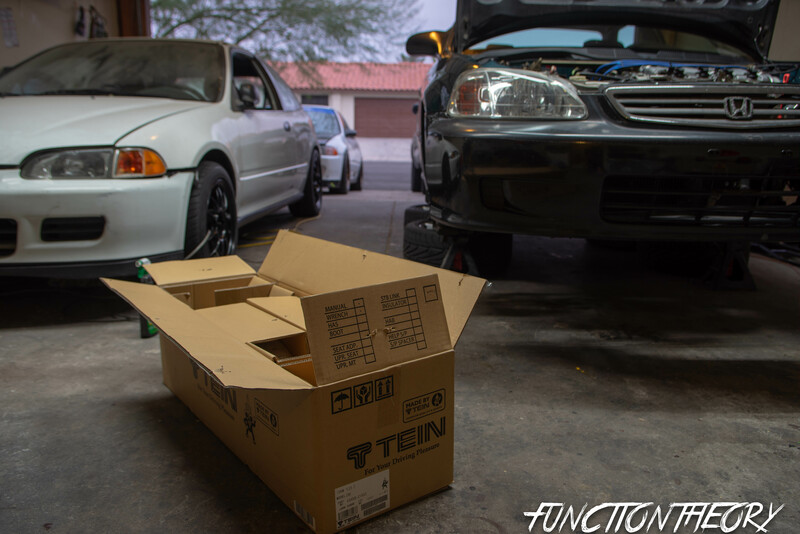 Installing coilovers is a relatively easy thing to do, it’s pretty self-explanatory. I feel like doing a how to on it is kind of silly, but I still hope to help someone get the motivation to work on their car. 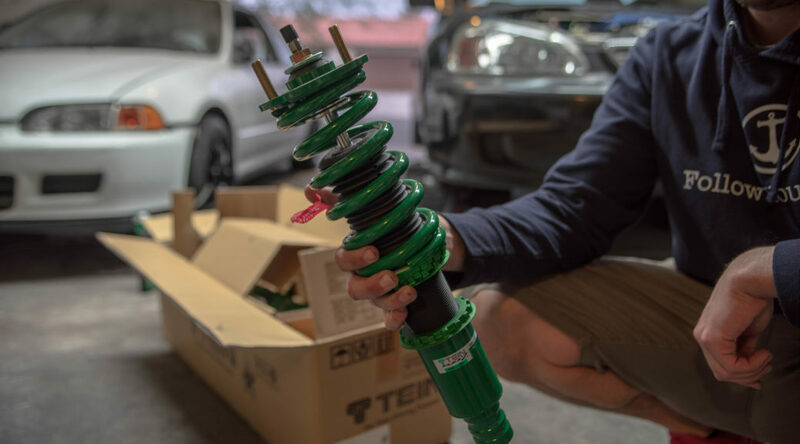 Let’s go over the list of all the coilovers I can think of that are sub 1000 dollars: Skunk2, Godspeed, Tein, Blackworks, Megan, D2, Tru hart, Blox, Buddy club, Function Form, Progress, Ktuned, BC racing, Ksport, and I’m not even going to try to list all the EBay/Amazon no name ones. 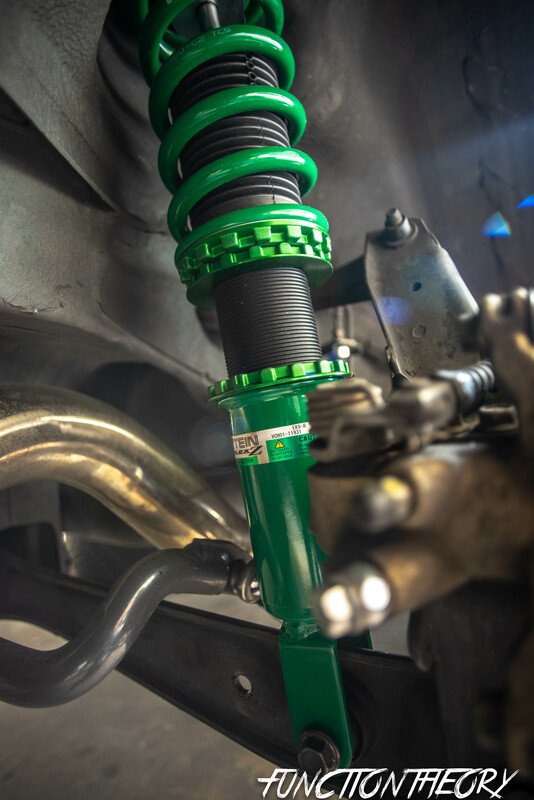 Yes you could probably get the Holy grail that is GC/Koni yellow but you would still technically want to get the top hats to help maintain full shock stroke. which is going to put you in the 1400/1500 range. But for bang for your buck this is hands down best setup. It’s very comfortable and yet still able to lay down some PB’s at the track. Take a look at those brands, I bet you have heard some horror stories about some of those brands, or some people dubbing new names for some of the companies whose products are junk. So after I choose to remove most of those names from my list of options, I was left with only three options one of which has been out of stock for quite some time, so technically only two were my option. I took to Google and YouTube and began reading/watching reviews. My immediate consensus was that all people on the internet are idiots, and shouldn’t be allowed to review products. This is also a good time for me to remind you that you should not believe everything on the internet, don’t base you decision around one person’s opinion. This is the reason that there is so much misinformation on the internet. We are so quick to believe one person just because they are popular, or have a cool car, or have done a track day once. We then go on and further spreading the wrong information throughout the community. 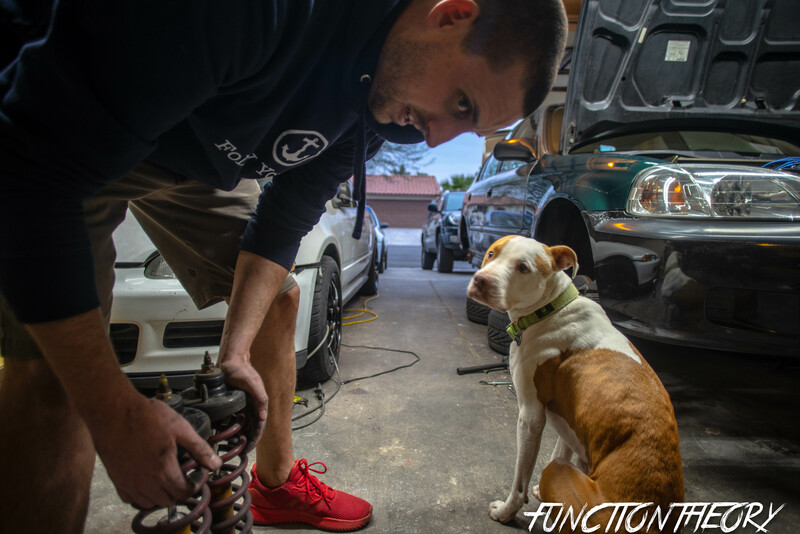 Don’t be afraid to question people opinion, or look deeper into something it will only give you more knowledge of cars, and make you a more well-rounded enthusiast. This is why I reached out to multiple reliable sources, and read and watched multiple reviews, then take my own experiences into account and end up choosing the Tein Flex Z. To be clear multiple people told me to just get GC/Koni Yellows, but it was just a bit too far out of my price range. If you have the money go ahead and get those for sure hands down. 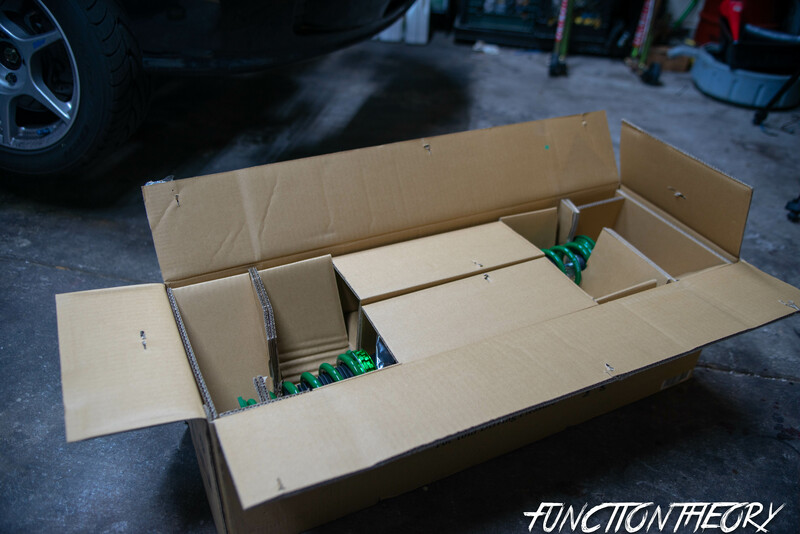 Upon opening the Tein box I was immediately reminded that I bought sub 1000 coilovers. You can instantly see how they were able to sell these for so cheap. the top hats are just welded together circular cut out steel, they are painted not anodized, they do not come with new nuts on the top hat ( so you had to reuse the oem ones), the welds were very “assembly” line looking, and the bump stops are just rubber instead of MCU urethane foam found on higher end coilovers. Let’s be honest though… none of this really matters. You won’t see the top hat once installed, It really doesn’t matter what the welds look like as long as they do the job ( which there is no doubt that they will ), having to re-use the oem nuts is no biggie, and the paint appears applied very generously. I’m actually a bit relieved that they cut costs is these areas. Now I can rest a little easier that the money went into the actual shock dampener, piston, shaft, oil, and dampening system. 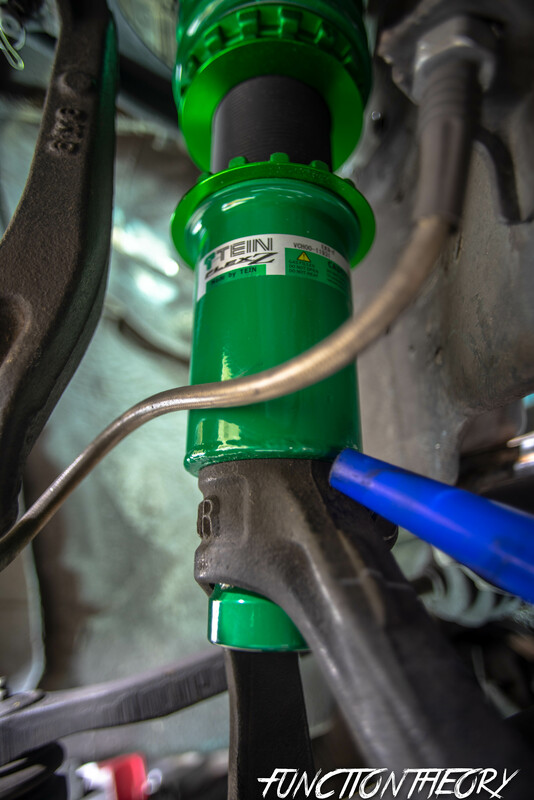 The shock is gas filled to help stop oil foaming and cavitation. I opted for the Teins because I have actually had the MONO FLEX on my EG for almost 8 years now and they have performed flawlessly. (I was using my firsthand experience to know that the Teins probably wouldn’t blow out since my mono flex hadn’t blown out yet, and that they had exceeded my expectations.) Everything went smooth on installation, not one issue with any of the quality or craftsmanship of them. This is where everything begins to go a bit south. I lowered the car onto the ground and was instantly disappointed, and felt immediate buyer remorse. I was even contemplating if I could return them. 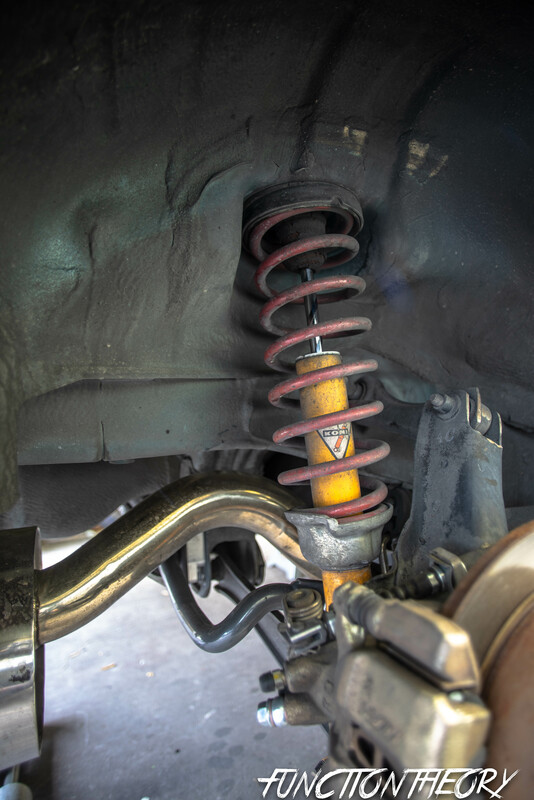 The Springs are very very soft, you can actually push down on the car and make it almost hop kind of like stock suspension. I couldn’t believe how not even close to performance these were, it was honestly like stock but just sitting lower. Now mind you there is 16 way dampening adjustability, and I had it set to the SOFTEST setting. I remember in a few of the reviews I had read and seen this was a common complaint. People said “on soft setting the car drives like a boat” “on soft setting the car sways a lot” I chose to ignore those reviews because after all I wanted a “soft” daily setup. Again I was immediately regretting my purchase. My freaking blown Koni Yellows, and Eibach sport line springs that was on it previously were way stiffer. But it was too late I couldn’t return them as they had already been installed. 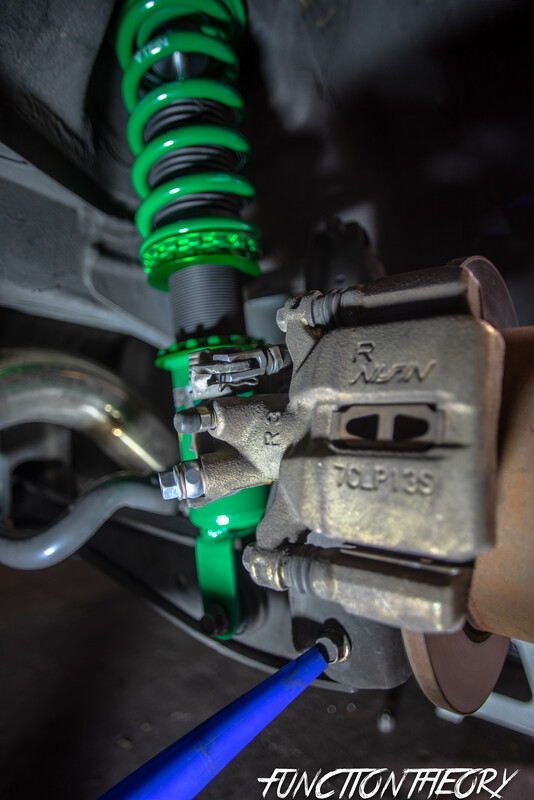 I just couldn’t believe that Tein would allow themselves to make such a non-performance coilover. Now in one of the reviews I remember it saying that adjusting the damping level to “8 clicks firmer” was much better and made the car feel stiffer. So I tried this and I still was not able to get past the fact that the spring rate is too soft or the valving is too soft. The car still moves up and down way too much for any sort of spirited driving. I decided to just go all in and turn it 8 more clicks firmer to make it maxed out at 16 clicks, as I backed out of my driveway hitting the bump where the sidewalk meets the street the car was very stiff however it would violently rebound back up. Again I was just super-duper disappointment. Ever and I hopped on the freeway and headed to the only mountain in Vegas. On the freeway on ramp ( which is a good testing corner for me, that I use frequently for research purposes.) The front end was literally hopping around the turn causing the front end to understeer and almost skip, totally running the apex wide. The rest of the trip on the freeway was so bouncy it was almost like driving on heated/cut springs, once we pulled off and started to head up the mountain I pulled over and had to take 3 clicks out of the damping ( making it at a total of 13 clicks ) Immediately the ride was much better much less bouncy. Unfortunately once we got higher up the mountain it was wet/foggy/snowish so I wasn’t actually able to push that hard, but overall the car felt much better. I began to have less regret of my purchase. I drove it to work the next day and I couldn’t really shake the thought of it being too stiff for a “daily.” That night when I came home I took one more click out (now I’m at 12 clicks) Again the next day I drove to work and back still thinking that it was a bit too stiff. I decided to take one more click out (making it now 11 total clicks). As of now I’m not regretting my purchase at all, the car drives much nicer without blown shocks, the car is much more responsive, and is fun to drive. I feel that as I drive the car more and dial it in more they will only get better. I technically only have about 200 miles actually driven which doesn’t constitute a thorough write up. I will circle back to this after a few thousand miles, hitting some turns more aggressively, and possibly after a track day. Side note.. it seems like when you adjust the clicks it really only makes the compression stiffer so the rebound becomes to fast and will “spring” back to quickly. If feel if you could adjust the rebound then you could make these feel amazing. All im actually doing when taking clicks out form max is making the dampening softer which in turn makes the whole suspension feel softer. 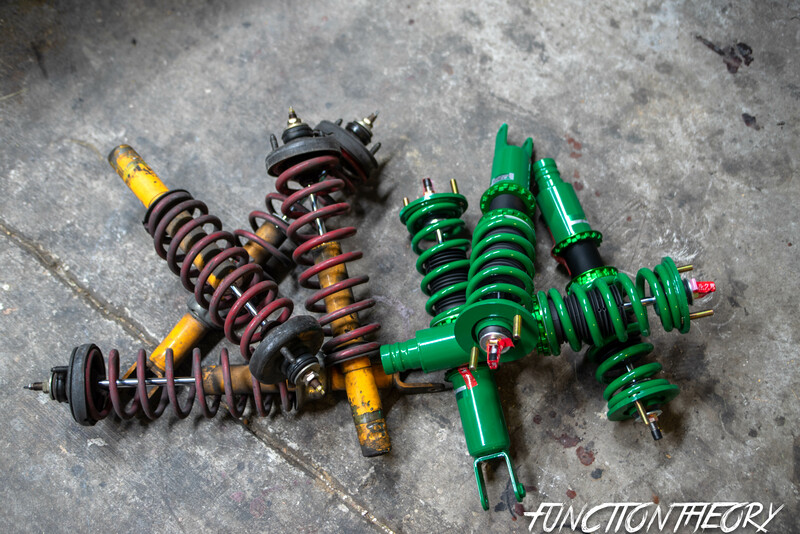 This is why on full softest settings these coils are like stock suspension. I have felt like I was able to find a happy medium with being at 11 clicks, and am currently happy. You would really be surprised at how much difference a few clicks make. Like really! In conclusion (pretty much all you need to read.) Would I buy these again? 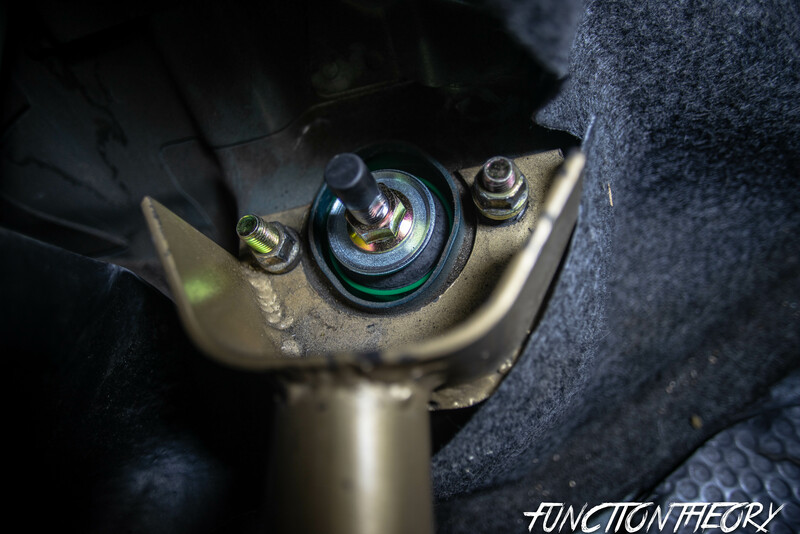 probably, If the Tein quality holds true, the shocks don’t blow out, and the dampening stays consistent. With the right amount of adjusting of the clicks you can dial these in pretty well. Again you have to remember that they are cheaper coilovers and are not going to give you the best handling experience possible. It is going to be better than stock though! and I know most of you can’t reference this, but it’s a lot better than my car was with the blown koni yellows and eibach sportlines. Trust me my car used to do work with this set up too. There will always be some shortcomings, and limitations of the Teins. 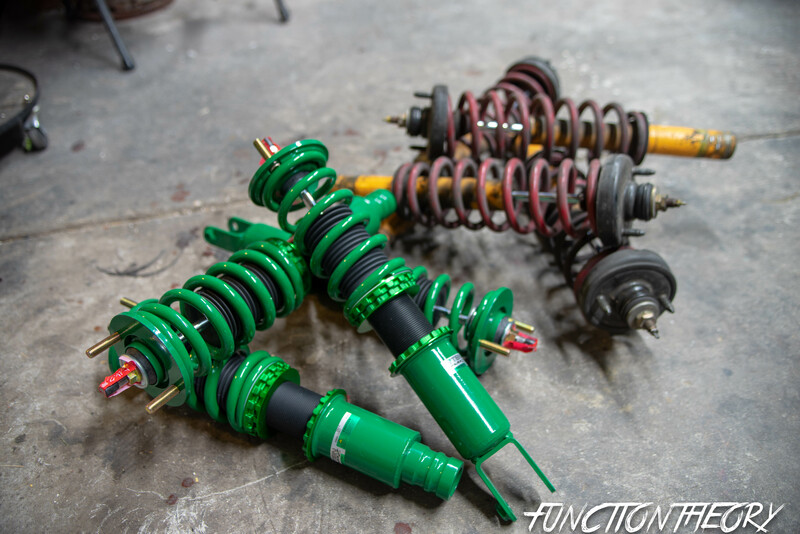 But if you remember that these are designed as entry level + coilovers then they will be good for you. After dialing my clicks in I’m very happy with the response and cornering ability of my car, and fingers crossed the reliability to the Teins will hold true. Let’s get brutally honest right now! I would actually probably just get GC/Koni Yellows and GC top hats. that recipe is a tried and true track tested set up, You honestly can’t go wrong. Yes all said and done you will be looking at about 500-600 dollars more than the Teins but the Konis are rebuild able, the GC coilovers come with eibach springs which have a great reputation, and you won’t feel limited under track conditions. Remember I can’t say for sure this about the Teins as of now, and like I said earlier I will do a follow up write up after a few thousand miles. Who knows? maybe the Teins will prove to be decent on track.